The island of St. Martin/St. Maarten is beautiful, high-class, and boasts many brag-worthy things. Not only does it have both a French side and a Dutch side, but you can enjoy your time here watching beautiful sunsets while surrounded by the mega-yachts of the rich and famous. This is one of the most beautiful and exhilarating Caribbean islands we have visited. A trip to the island is not complete without spending a day at Maho Beach where your time can range from relaxing while you soak up the sun to screaming as jumbo jets land at dangerously low altitudes above you. I don’t know of any other place where plane spotting is this exciting or dangerous! Maho beach is located at the end of one of the runways of Princess Julianna International Airport. Because this particular stretch of runway is very short and accommodates large planes, it has been dubbed one of the most dangerous airports in the world. Seriously! Regardless of their size, planes must descend quickly in order to make their landing. The plane spotting spectacle and accelerated thrill at Maho Beach are literally enough to lift you off your feet! Although your day might start with some smaller planes coming and going, this just allows you to practice your camera skills and prepare for the arrival of the big planes! It is so much fun to sit on the beautiful beach and wait for large planes with heightened anticipation. While small commuter planes come in constantly, the arrival of the big jets creates quite the commotion. The Sunset Beach Bar has a sign indicating what flights are arriving when so you can plan for the big ones. Or, you can just patiently wait as you soak up the sun. Either way, you will not be disappointed by your time spent on this beautiful stretch of beach. As the jumbo jets approach for landing, you will start to feel excitement, fear, uncertainty, and awe wash over you and it feels like you could reach up and touch one of them as the blast over the top of you. This beach is famous for these extreme close-call landings! Equally thrilling, but far more dangerous, is when one of the massive jets takes off from that runway, which is just across the narrow street separating the beach from the airport grounds. Against the orders of local law enforcement, hoards of people will claim their spot on the retaining wall as they wait for the jets to hit the end of the runway. Once those planes kick it into high gear and start to take off people literally go flying as the result of the jet stream blast. From the Sunset Beach Bar, we watched people get thrown into the water while others tried to take cover from the severe sandblasting they were receiving. This place is serious business! Our plan was to hit the retaining wall before we left – just to say we did it – but unfortunately the beach was hit by a torrential downpour before we had the opportunity. Dang it!! The next time we return to St. Maarten, we will make sure to try our luck with riding the jet stream. And, for those of you who cast your guess to my question posted on Facebook and Twitter, here is your answer! 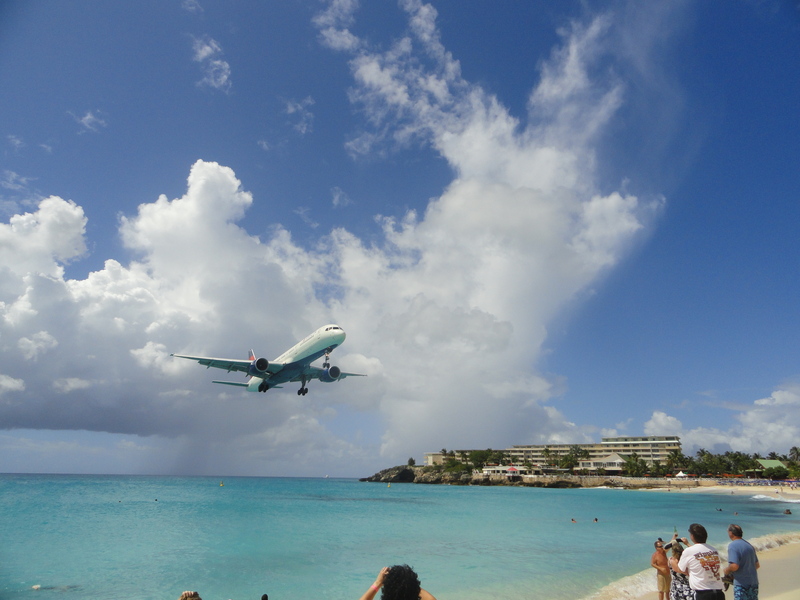 The header image for my blog and social media accounts was taken at Maho Beach! I’m honestly pretty proud of this awesome shot! If you like this post, please feel free to share and please click the follow button to subscribe to my blog and see the rest of our adventures! Madrid; A City Of Museums, Gardens, and Culture! Cool! That sounds like a good idea. This is a place on my to-do list for sure. I would love to go when it’s not crowded though. Any suggestions on the best time for low crowds? We visited in February. There was a moderate amount of people but not super crowded. We also arrived early in the day to claim our spot! I’ve always wanted to visit here! Great post! Thanks! It is such a cool place! Oh I have heard of this place before. I need to put this on my bucket list!! Add it to your list for sure. You won’t be disappointed! Thanks for the share on Twitter! Been wanting to go there for so long! Would love the plane spotting! You’ll love every minute of it! Yes, the beach is great too. Although we visited in February, I was still a little surprised at how cold the water was! Still, such a beautiful beach on a beautiful island! Definitely want to visit here too! The list just keeps getting longer and longer, right?!? Love the panoramic shot of that plane haha. Honestly, I don’t think I would enjoy this too much, it seems anxiety-inducing not to mention all that sandblasting. I imagine there are quieter parts of the beach too right? This beach is pretty small, but there’s tons of other beaches on the island that don’t have as much commotion! Loved reading your post! sounds like great fun. It was only a couple of weeks ago that we found the live streaming webcam from the bar on this beach, and I said to Phil we have to go here one day! The sandblasting sounds painful! Must be a great spectacle. I will have to check out their webcam – that’s cool that they put one up! It’s one of my favorite spots in the Caribbean!! Thank you so much for reading and commenting! It’s much appreciated! Very near the top of my Bucket List is sitting at Sunset Bar and watching the planes and people. I love the idea of being airborne by the jet blast…but not the sandblasting that comes with it. We’ll be watching the blog so see if you ever make it to the wall! Make sure to have a Guavaberry Colada while you are there! It’s their national drink and they are SO GOOD! That is CRAZY! We need to visit here! Thanks for sharing! OMG! How are you?! Thanks so much for checking out my site! Yes, you guys need to go there! We need to get together soon! !